It looks like that comfy soft canvas bag from a previous era, but the new Lowepro Pro Messenger 200 AW camera bag is anything but old fashioned. What feels like canvas is actually a high-tech fabric that is lighter, more weather resistant, and wears longer than traditional fibers. The 200 AW can accommodate a 70-200mm f/2.8 lens on body, and still have room for other lenses, accessories, and an iPad. 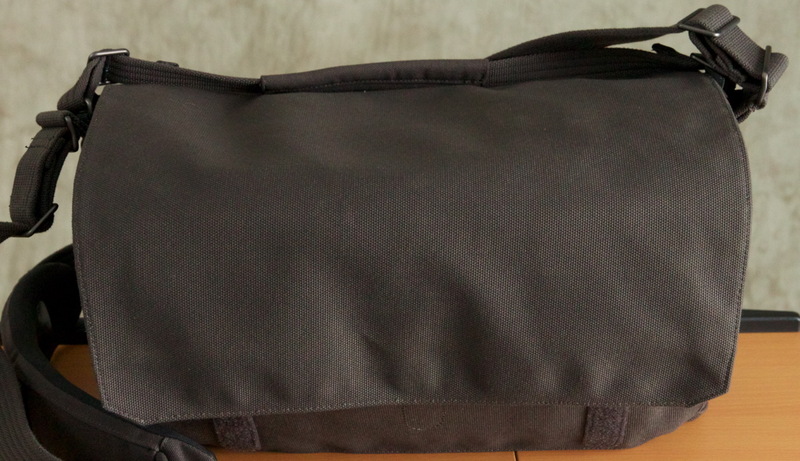 I've been using the Pro Messenger 200 AW for a while, and I've come up with an alternative way to pack the bag by creating a false bottom with one of the dividers. Here's how that works. If you like shoulder bags for you gear, and find the tactile sensation of a canvas-like fabric appealing, then take a look at the Pro Messenger 200 AW. It's available for preorder from B&H Photo for $189.95. 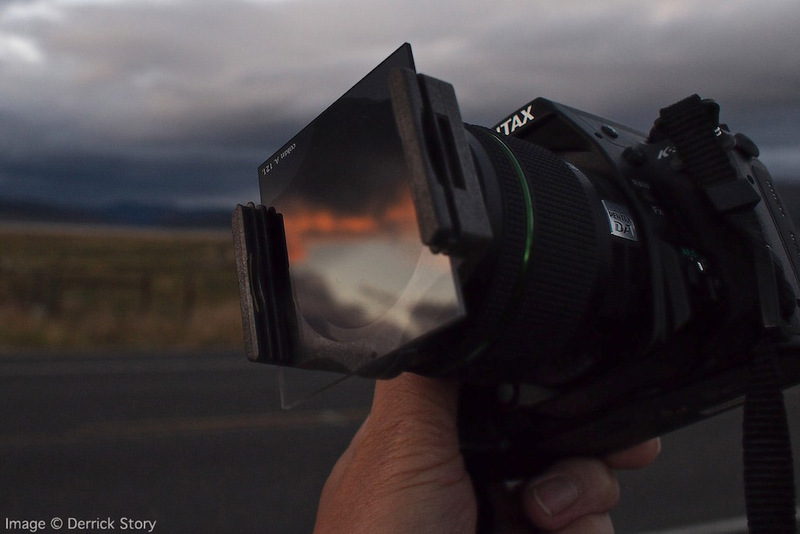 When working in clear air, especially in the mountains, keep an eye on your sky when using a polarizing filter. Believe it or not, you can overdo it and ruin your shot. I had to back off the polarizer in this shot to get a consistent blue in the sky. Other images in this series didn't fare as well. 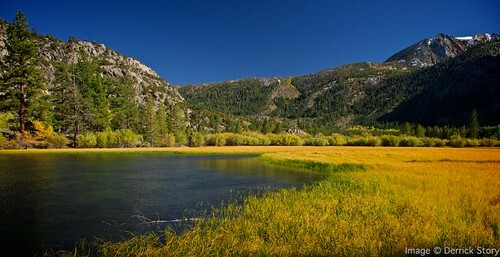 The tendency for many photographers using a rotating polarizer is to crank it all the way for the most intense effect. The problem at times can be that the effect isn't applied evenly across your image. The result can be a splotchy blue sky that is very difficult to fix in post production. Look out for this phenomenon when working in the mountains. You might find that you get the best photograph with just a little polarization. In his latest book, The Passionate Photographer, Steve Simon presents 10 steps toward becoming great. For example, in Step 3, Work It: Don't Give Up on the Magic, he writes, "Your first shot is your starting point. Give yourself a variety of options. It's a game of inches. Slight movements have dramatic effects on your final image, altering the juxtaposition of foreground subjects with background elements and the horizon." Each step is explained from a variety of approaches and illustrated with numerous images. This is not a book for the beginning photographer still learning the camera. The Passionate Photographer is for shooters ready to take the next step. With its mix of inspiration and perspiration, Steve Simon challenges you to get better. I'd keep this book in mind for the passionate photographer in your life. It would be a great holiday gift. Two big topics this week! I'm heading out to PhotoPlus Expo in New York and will talk about what's going on at that event. It's one of my favorite photography gatherings. Then I'll spend some time discussing the Pentax K-5 DSLR that I've been testing. It's quite a camera, and I have lots to say about it. In fact, I'm going to visit the Pentax folks in NY at PhotoPlus to see if I can get a few more lenses for testing. All this, and more, in this week's TDS podcast. 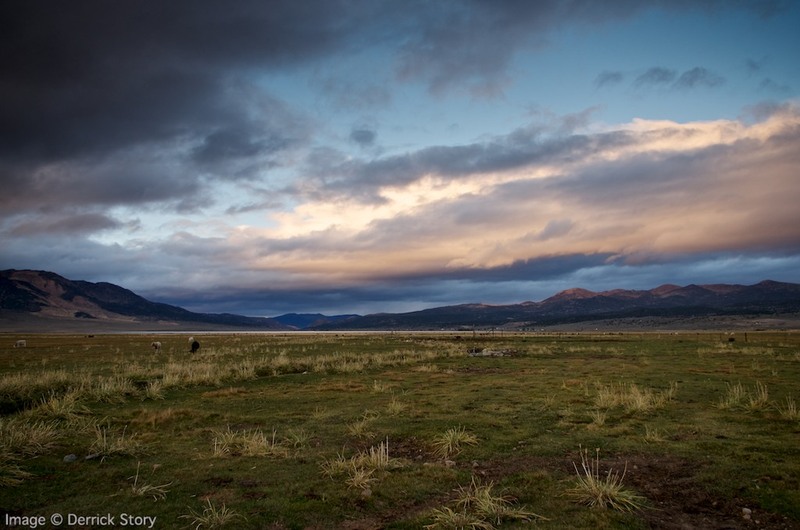 I packed a Pentax K-5 DSLR on a recent trip to the Eastern Sierra to test its ruggedness and picture quality. In short, it impressed me on both counts. Pentax K-5 with Cokin Graduated Filter. Photos by Derrick Story. Click on image for larger size. 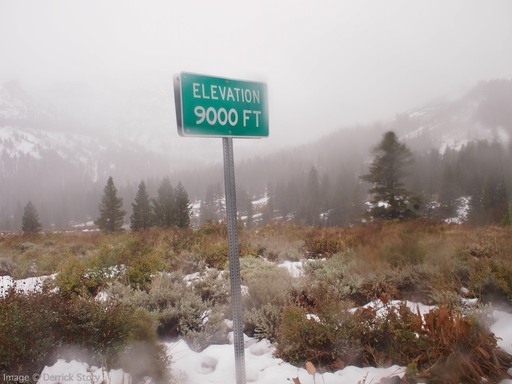 On the very first day I found myself in the rain at 9,000 feet at Sonora Pass in Northern California. I had to protect the other cameras I had with me. But with the K-5 in hand, I marched out into the hostile environment and shot pictures for about 20 minutes. 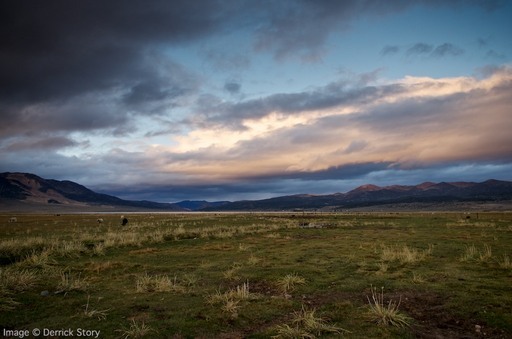 In these hostile conditions I could march out into the environment with the Pentax K-5 in hand. In terms of performance, good conditions or not, this camera has some excellent specs: 16.3 APS-C image sensor, useable ISO from 80-3200, 7 fps burst mode, 1080p video, 3" LCD with 921,000 dots, 100% field of view optical viewfinder, body-based shake reduction system, both Pentax PEF Raw files and Adobe DNG capture, and in-camera HDR. Here's one of my favorite photos from the trip captured handheld at twilight with the Pentax K-5. Twilight landscape capture with the Pentax K-5 and and kit 18-55mm zoom. 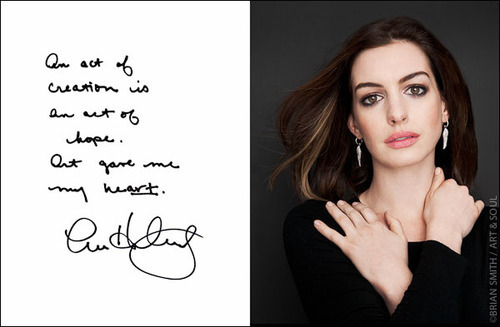 Click on image for larger size. You can get this camera and lens for Pentax K-5 $1,350 US. And for your investment, you get a serious camera for outdoor work. I'll be writing a bit more about the Pentax K-5 in coming weeks, including a full review on Macworld Magazine. I love the morning light. So as I'm heading out the door, I usually grab a camera for my walk. Today, I had the Olympus PEN E-PM1 with the 17mm f/2.8 prime lens. I love this combination because it is very compact, yet produces great results. I'll have the PEN Mini with me on my trip to Photo Plus Expo this week. If you see me there, please say hi! 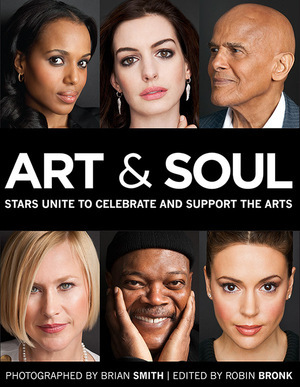 Inspirational Reading for Photographers - "Art & Soul"
The first time I saw Brian Smith shoot, I realized how he makes those compelling portraits. Brian is like a sculptor. And with his camera he chips away all distracting elements until he discovers the essence of his subject. 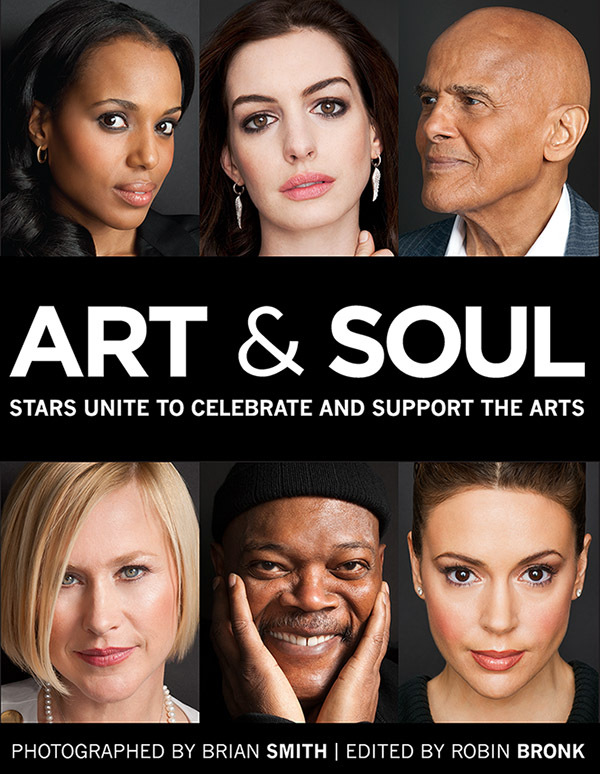 You can experience this for yourself by getting your hands on a copy of Art & Soul, a stunning collection of portraits and thoughts by well-known actors, musicians, and filmmakers. Brian teamed up with editor Robin Bronk to portray the thoughts and images of dozens of stars sharing their views on the importance of art. The book was created in partnership with the Creative Coalition, and a portion of the proceeds will support their nonprofit programs. Now here's the truly amazing part. You can purchase this book on Amazon for $26 with free shipping. And it's a lot of book: 13" x 10.5", 256 pages, over 4 pounds. I recommend it not only for all portrait photographers, but for anyone who loves the arts and admires those who create it. Art & Soul is inspiritional reading. You may want to buy two copies: one for the artist in your life, and the other for you. Want to say "Thank You" to that office coworker who went the extra mile, school volunteer who helped your kids, or hair cutter who made you look spectacular? Hand them a personalized photo card that you designed and produced yourself. One size that I think is particularly attractive is the 5.5" x 4.25" A2 card produced by Red River Paper. There are six surfaces available in this size: 1 glossy, 3 mattes, and 2 specialty. Red River also offers plenty of help so you can set up your inkjet printer to produce these mailable works of art. For the finishing touch, put your cards in envelopes or clear top boxes. And remember, the holiday season is right around the corner. 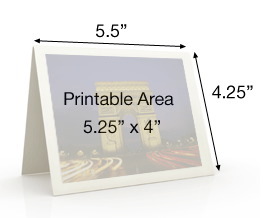 Choose a handful of your favorite photographs and print a stack of cards to have on hand. Not only will the recipients be impressed with your artistic prowess, many will be flattered that you've shared your work with them. It's as light as a feather and as snug as a glove, and it mounts your iPhone to a tripod or serves as a stand. 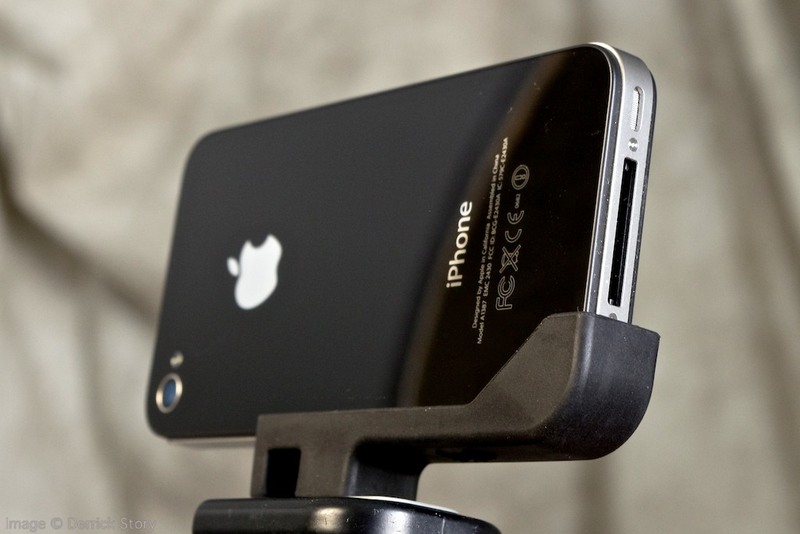 It's the Glif for the iPhone 4/4S. I keep one in my shirt pocket when I'm out and about. I use the Glif for making movies as well as watching them. For $20, it will kick-start your photography with your new iPhone. Now, more than ever, your iPhone photos need to be incorporated into your photography workflow. 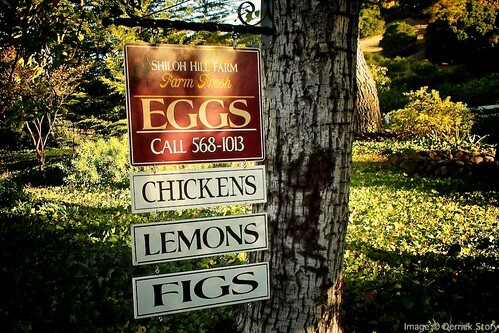 With the 8 MP camera in the iPhone 4S, you have print-worthy images of important events that should be properly cataloged. 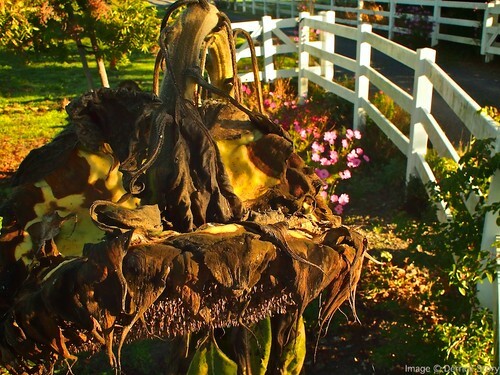 In iOS 5, Apple introduced Photo Stream to help with this situation. I'll cover the ins and outs of this technology in a future post. But for those who need a bit more control over sync between iPhone and computer, or for iOS 4 users, there's a terrific app $1.99 called PhotoSync that I have found invaluable for managing my iPhone photos. PhotoSync easily moves images from the iPhone to a dedicated folder on my Mac. I then import those pictures into an Aperture library. On import I can add more metadata to the images and organize them as well. Install PhotoSync on the iPhone and Mac. Launch PhotoSync on the iPhone. Select which device to sync to. You choose your computer, iPad, iPod Touch, or another iPhone. If PhotoSync is active on the receiving device, it will show up in the list of destinations on your iPhone. Upload the photos from the iPhone to the Mac. 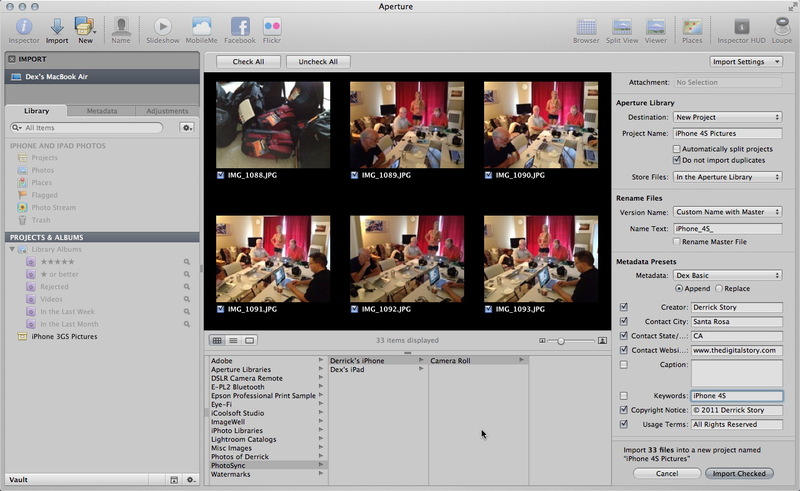 Open Aperture and choose Import. Ensure that the "Do not import duplicates" box is checked. Click Import and enjoy working with your images. The Aperture Import dialog for my iPhone images. Click on image for larger size. I don't maintain just one Aperture library. I have many that I use for different purposes. One of those libraries is dedicated to my mobile photography. This workflow, using PhotoSync, makes it easy to keep my iPhone pictures safe, and available for use. 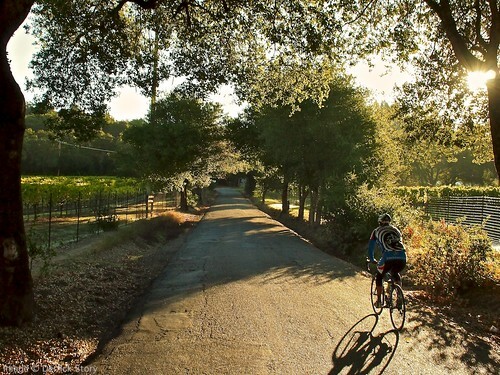 My next Aperture Workshop is Nov, 12-13, 2011 in Santa Rosa, CA. Write me if you're interested in attending.